Although there are many books on root cause analysis (RCA), most concentrate on team actions such as brainstorming and using quality tools to discuss the failure under investigation. These may be necessary steps during RCA, but authors often fail to mention the most important member of an RCA team—the failed part. 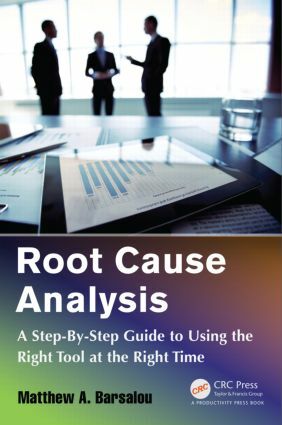 Root Cause Analysis: A Step-By-Step Guide to Using the Right Tool at the Right Time provides authoritative guidance on how to empirically investigate quality failures using scientific method in the form of cycles of plan-do-check-act (PDCA), supported by the use of quality tools. Focusing on the use of proven quality tools to empirically investigate issues, the book starts by describing the theoretical background behind using the scientific method and quality tools for RCA. Next, it supplies step-by-step instructions for performing RCA with the tools discussed in the first section. The book’s clear examples illustrate how to integrate PDCA with the scientific method and quality tools when investigating real-world quality failures. This RCA guide provides root cause investigators with a tool kit for the quick and accurate selection of the appropriate tool during a root cause investigation. It includes an appendix with a guide to tool selection based on the intended use of the tool. There is also an appendix that defines the terminology used in the book. After reading this book, you will understanding how to integrate the scientific method, quality tools, and statistics, in the form of exploratory data analysis, to build a picture of the actual situation under investigation that will lead you to the true root cause of an event. The tools and concepts presented in the text are appropriate for professionals in both the manufacturing and service industries. Matthew Barsalou is employed by BorgWarner Turbo Systems Engineering GmbH, where he provides engineering teams with support and training in quality-related tools and methods, including root cause analysis. He has a master of liberal studies from Fort Hays State University and a master of science in business administration and engineering from Wilhelm Büchner Hochschule. His past positions include quality/laboratory technician, quality engineer, and quality manager. Matthew Barsalou’s certifications include TÜV quality management representative, quality manager, quality auditor, and ISO/TS (International Organization for Standardization/Technical Specification) 16949 quality auditor as well as American Society for Quality certifications as quality technician, quality engineer, and Six Sigma Black Belt. He is the American Society for Quality’s Statistics Division Newslettereditor and a frequent contributor to Quality Digest, the Minitab Blog, and has published in German, American, and British quality journals.